Back from a lovely vacation in Massachusetts and Maine. Saw friends, relatives and elderly parents. Walked long path in Lexington. Walked the beach and swam in the ocean. Jumped those salty icy waves! Saw my women’s group friends (30 plus years and counting). Walked Back Cove in Portland. Ate with friends: lobster, more lobster, lobster roll. Maine (from the mud crab) crabmeat roll. Blueberry pancakes, Blueberry pie. Whoopie Pie. Donuts. Currently eating in Maine vacation recovery mode: salad, fruit salad, more salad, yogurt. While in Mass., visited John Adams’ home in Quincy. Because we now live surrounded by presidents’ homes and quite close to Monticello in Virginia, I thought I would like to see Adams’ house. Interesting. Peacefields is as much Adams – a large colonial house befitting a president, but basically a solid place to live -- as Monticello is Jefferson -- a lavish experiment in architecture and botany. Highlight of the Adams’ house was a separate building – a library. A wonderful place of dark wood and wooden shutters, library ladders, comfortable chairs, a long work table and volumes and volumes of old books. It was built by Charles Francis Adams, not by either of the two presidents. Saddened by: The death of Dutch. 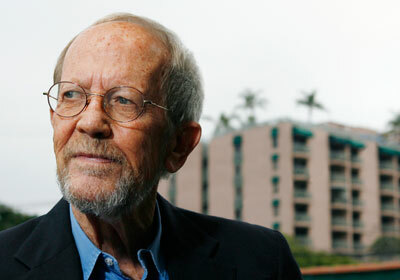 Elmore Leonard, one of my all-time favorite writers, died this week. I saw him described in a newstory as the one who was always the coolest guy in the room. I know that was true when I sat reading his books. I remember once in the early 80s wheb asked asked who my favorite writers were, I replied: John Fowles and Elmore Leonard. That dates me. It also reveals me: the schizoid reading patterns just continued to develop as I did; literary fiction and crime novels, elaborate and gritty, layered and plain, serious and playful, elusive and defined plots. Reading: Listened to Reza Aslan’s Zealot: The Life and Times of Jesus of Nazareth, the book made famous by Lauren Green’s embarrassing interview with the author on Fox news. Green repeatedly asked how a Muslim could write a book about Christ. Others called her ignorant. To me it was clear she was being fed really bad slanted questions written by aides, had not read the book and was totally unprepared. And they call this journalism? Enticed by the brouhaha that followed, my husband and I were among those who purchased the (audio) book, among those who helped it climb best seller lists for a short time. (Take that Fox news). Writing: none. Behind now 3 (fiction) reviews. Back to: My dog, my job, my reading, my blog. Hi-ho. Hi-ho. Off to work I go. Second, I've only read a little of the later Leonard, a few books that were take-offs for the series Justified and I hate to say it, but I wasn't super impressed. I might need to read some of his earlier works. Where do you recommend I begin? I haven't read the Raylan books, though I love Justified. I did read a review saying the last books were weak -- kind of sketchy. I loved Leonard in the 80s. So Killshot, Freaky Deaky, Get Shorty, and earlier books. The characters were always saying/doing unexpected things. Such an ear. Such clean writing. Fowles is very hi-brow and convoluted. The Magus and The French Lieutenant's Woman are the top two. Of those, FLW (made into movie with Meryl Streep) is the most approachable -- about Victorian England. Your vacation sounds wonderful! I've been to Massachusetts (only once), but it was during the fall and it was blissful and memorable. Maine is on my bucket list. So sad about Elmore Leonard. I love Maine and would have lived there forever, but my husband the Maine native said enough snow. So now I have to go as a tourist!! Move it up on your list. I am 9/10ths done with one and hope to post tomorrow. Saw that list. It's quite long. I start to lose the intensity of my thoughts if I put them off too long. Beaches, Lobster...perfect ! I finally got 'Old Filth' from the library , loved it ! I 'm now reading ' The man with the wood hat ' and Ian McEwan 's ' Sweetbtooth' ..Both these came from my library hold ...thought I would be waiting for months again. It was perfect Linda. So glad you are reading Old Filth and the man. Such great books. Not well known enough. Keep spreading the word.